In a few weeks (if not sooner), heirloom tomatoes will disappear from farm stands in New York City, not to be seen again until next summer. You may have heard of widespread cases of tomato blight that occurred all throughout the eastern seaboard of the United States earlier this year. I know of at least two farmers who had to throw out over $50,000 worth of product during the first harvest in late July. The expected increase in price hasn’t materialized but I can’t help think that quite a few vendors won’t be returning next year in order to recoup their losses. Tonight’s dinner is loosely based off of this recipe found in this article from this past Wednesday’s New York Times. Ripe tomatoes are roasted with a bit of olive oil, salt and pepper, then handfuls of fresh sheep’s milk ricotta are scattered over. The result is a sweet, luscious sauce that conjures up a haunting memory of summer and a taste of a season to come. Click here for a high-res version of this picture. Pre-heat oven to 350 F. Halve tomatoes and arrange in a Pyrex baking dish, roasting pan or cookie sheet. Generously sprinkle with salt and pepper, then drizzle with olive oil. 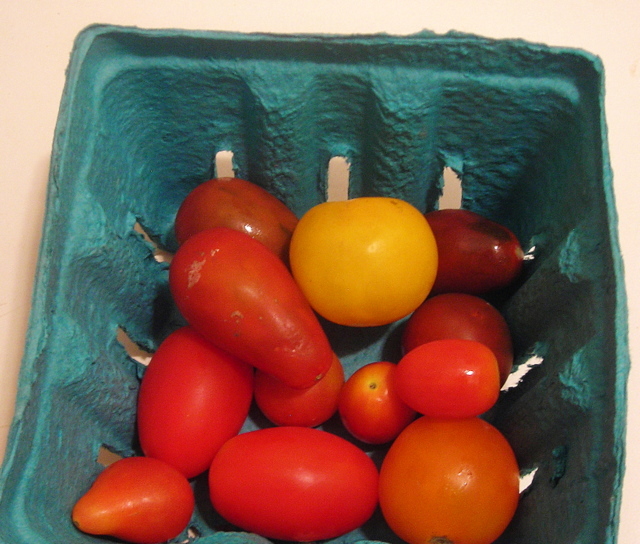 For this tray of tomatoes, I used about 4 tablespoons extra-virgin olive oil. 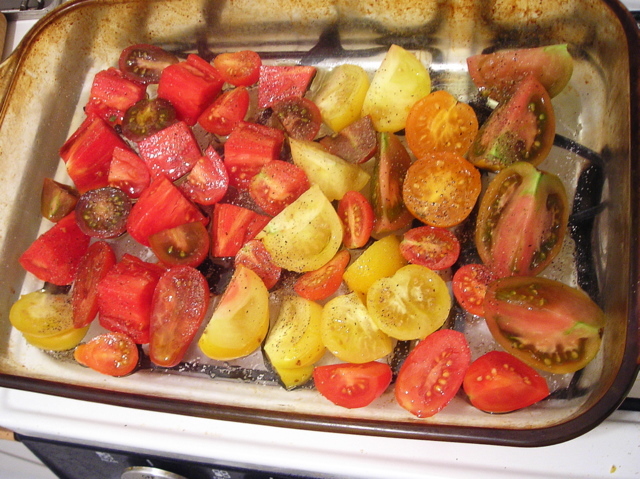 Roast for 45 minutes until tomatoes are caramelized yet still hold their shape. Meanwhile, cook pasta until al dente, then drain. Break up ricotta with a fork so that ricotta forms small “lumps”. When tomatoes are done, scatter ricotta atop tomatoes. Wait a couple of seconds so that the cheese melts, then fold tomatoes into the ricotta. Season to taste with salt and pepper, stir in herbs. Fold pasta into sauce, toss to coat, and serve at once. 16 Oct	This entry was published on October 16, 2009 at 2:55 am. 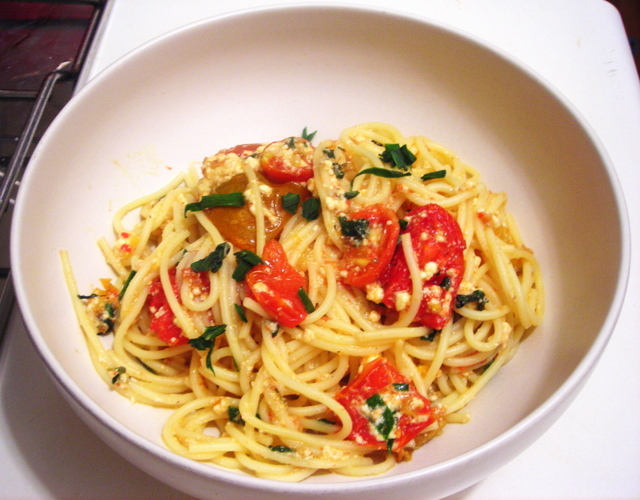 It’s filed under autumn, food, general, Italian food, Union Square Greenmarket, vegetarian and tagged cooking, dinner, heirloom tomatoes, recipe, ricotta, spaghetti, tomato blight, vegetarian. Bookmark the permalink. Follow any comments here with the RSS feed for this post. Some friends brought over heirloom tomatoes the other night, along with a nice baguette….we sliced the tomatoes on the bread, drizzled them with olive oil, and then plenty of fresh coarse cracked black pepper. It was delicious! You really don’t need to do too much to in-season tomatoes. It sort of makes me more appreciative than ever when they’re around. When it’s cold, gray and wet in the middle of February, the thought of a fresh tomato sandwich on a roll slathered with [homemade] mayonnaise and just a tiny bit of salt and pepper is almost too much to bear…. 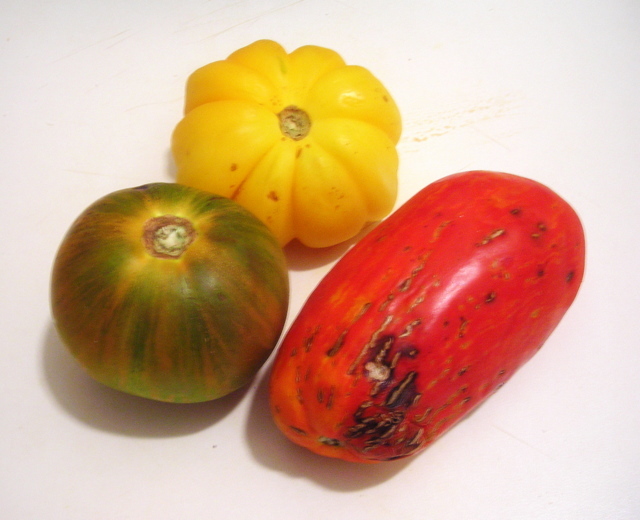 that is the trouble with heirlooms; they don’t travel well; usually have to get them locally and quickly.